Shoreline Area News: Where in Lake Forest Park is Ray Skjelbred and his dolceola? Where in Lake Forest Park is Ray Skjelbred and his dolceola? 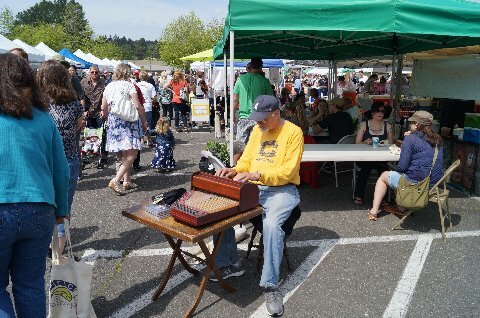 For the past five years, virtuoso jazz pianist Ray Skjelbred has played his dolceola for the Lake Forest Park Secret Garden Tour and Market, which is held this Saturday from 9am to 3pm starting at Town Center in Lake Forest Park, intersection of Bothell and Ballinger Way. As much as we’d like to share his location with you — we can’t, because like the six private gardens being featured — it’s a secret. If you do go on the Secret Garden tour, you’ll probably recognize Skjelbred as that nice guy who plays on sunny Sundays (when he feels like it) at the Lake Forest Park Farmers Market. He’s been doing that for the past eight years and is a favorite with the crowd. Skjelbred likes the softness of the sound in the crowd. When he plays at the market and elsewhere, he says, “I want everything that’s in me to be in my music ‘right now’. Like the market and the dolceola, Skjelbred himself represents a rather alternative way of doing things. Most pianists, especially those who go on to be virtuosos, start their piano studies at an early age. But he didn’t start playing the piano until he was 18. So, he learned how — working on his own and with a piano player who was phasing out of performing to concentrate on giving lesson. “I’ve always tried to pursue my truest self,” he says, and playing first the piano and later the dolceola are expressions of that pursuit. He is also an accomplished poet and has published several books of poetry. Skjelbred continued to study piano as he went through college and started teaching high school English. It wasn’t until 2002 that he found his dolceola at a garage sale in the Lake Union area. 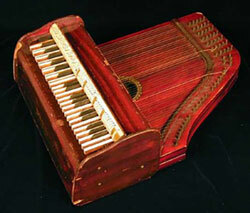 It’s a combination of piano and zither and very hard to find. It was built by the Toledo Symphony Company from 1903 to 1907. According to Skjelbred, his specific instrument was made in 1904. Designed as a learning instrument, its complex construction makes it hard to play. 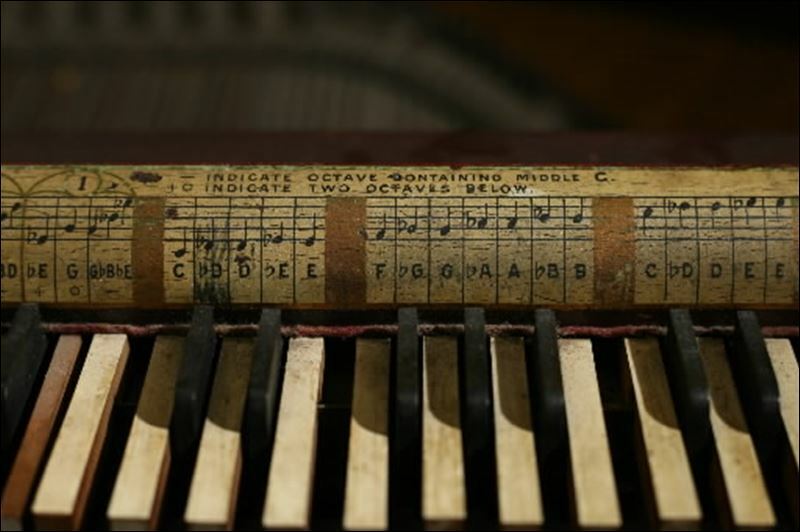 On one side of the keyboard, the keys are grouped into chords and the notes of those chords. On the other side, it’s two octaves of keys played like the piano. Skjelbred had been looking for one ever since he’d heard a recording of a late 1920s street musician in Texas named Washington Phillips. The instrument he’d been playing was mistakenly identified as the ‘dulceola’ by Frank B. Walker, the talent agent who recorded Phillips and who also discovered Hank Williams and Bessie Smith. At the time Skjelbred started searching for the instrument he didn’t realize that Phillips was perhaps playing either two different types of fretless zithers (a celestaphone and a phonoharp) or something quite different which has come to be known as a Manzarene. In the end, Skjelbred doesn’t really care that he went in search of one sound and found another. That’s just fine with him, because Skjelbred loves the sound the dolceola creates. How did he learn to play it? There’s a chart on the instrument and he just figured it out. Skjelbred, who has played on over 100 albums, still does at least 100 gigs a year. He’s traveled extensively to play concerts, festivals, and private parties and has performed all over California, where he lived for several years, and in Scotland, the Netherlands, and England. “I’ve never looked for a job,” he says. The jobs always just seem to find him. Born in Chicago, Skjelbred has lived in many places. For the last several years, he has lived in Lake Forest Park with his wife Elsa Bouman, who is active in the community’s art scene, and their dog Pika. You can learn more about Skjelbred and the dolceola on his website, which includes pictures of the instrument and videos of him playing.